T.H.E.M. 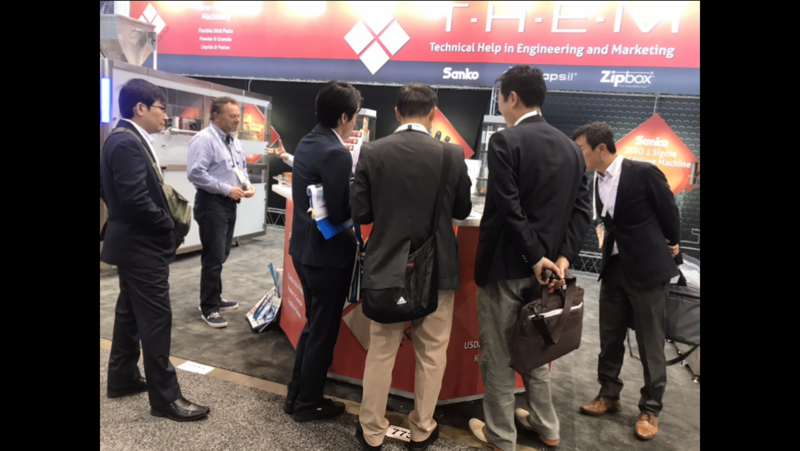 demonstrations of new Sanko high performance stick pack and sachet machines praised by Pack Expo attendees - T.H.E.M. Visitors to the T.H.E.M. booth at Pack Expo 2018 experienced first-hand the superior quality and high-speed performance advantages of the Sanko FC-1000 Powder Stick Packaging Machine and the Sanko FR-3 Liquid Filling Machine for Sachets. T.H.E.M., exclusive North American representative for Sanko Machinery Co., is a proven leader in creating new opportunities with single-serve flexible packaging solutions. The demonstrations of these two, best-in-class Sanko machines given by T.H.E.M. 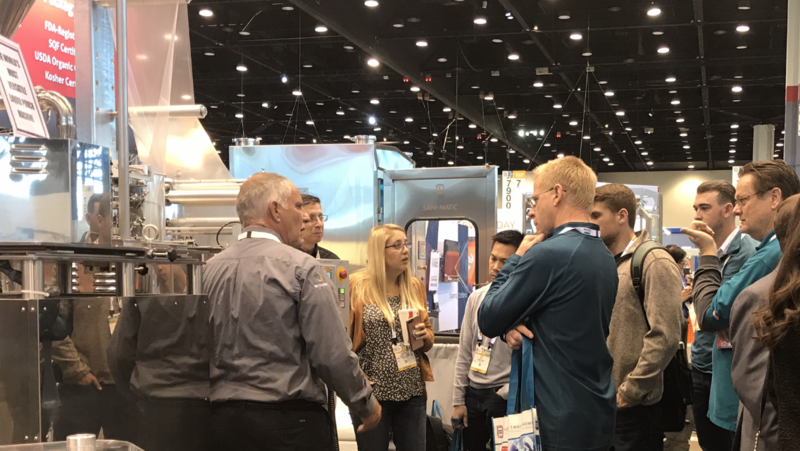 technical representatives at Pack Expo showcased the many ways that brand owners can capture greater market share and attract new segments of customers. Sanko FC-1000 – With an established reputation for dependability and performance this 16-lane, high-speed powder stick packaging machine has a range of new features that deliver even greater productivity and simplified operation. Color HMI with easy-to-read functions allows for observance of PLC-ISO diagnostics, like film tension and temperature controls while the machine is running. Efficient and reliable systems make the machine easier to operate, more robust, and easier to use for a broad range of products and product categories. Sanko FR-3: A decisive advantage. Besides being the world’s fastest liquid pouch machine of its kind, the FR-3 now has more features for greater versatility, making it the ideal sachet solution for salad dressings, condiments and a wide variety of consumer products of varying viscosities. The FR-3 is available in narrow web and multi-lane configurations and can be set up for both three- and four-sided form-fill-seal packaging of liquid products. The FR-3 is well suited to package soup concentrates, toppings and salad dressings, in addition to cosmetic and personal care products. The FR-3 uses less film because of its near-zero headspace, which helps lower material costs. The adaptable system accommodates liquid filling for a broad range of consistencies, including gels and pastes, while a proprietary ultrasonic system allows sealing of products containing particulates. Remember, the T.H.E.M. solutions experts and technical representatives are always available to discuss how to create more impact for your products and greater market share with your customers. 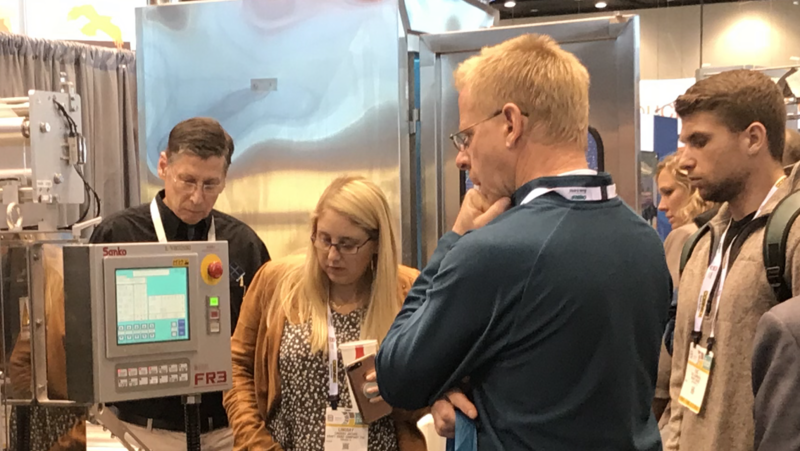 Whether you were on hand to experience one of our demonstrations or were unable to attend the show and would like to know more, you can reach us at 800.322.8436.